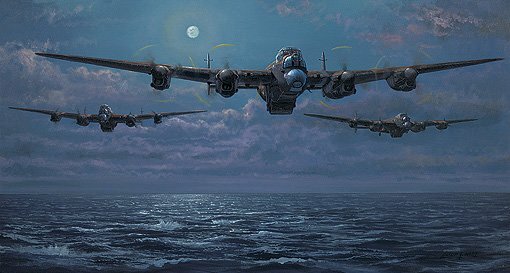 Lancasters of 617 Squadron, led by Wing Commander Guy Gibson begin their low level cross channel dash towards the enemy coast on the way to the heart of the Ruhr. The aircraft were arranged in three waves. The first wave comprised three groups of three aircraft at 10 minute intervals and headed towards the Mohne, Sorpe and Eder dams. The second wave of five Lancasters headed direct to the Sorpe whilst the third wave of five, would act as backup. Eight Lancasters failed to return from the raids, a high cost indeed, but the courage and determination displayed by the crews were in the best tradition of the RAF. The Primary Edition is signed by Squadron Leader George L. Johnson DFM (Bomb Aimer on AJ-T, American Joe McCarthy’s Lancaster.